d3VIEW is a data to decision platform that provides out-of-the box data extraction, transformation and interactive visualizations. Using d3VIEW, you can visualize, mine and analyze the data quickly to enable faster and better decisions. It can integrate with any High Performance Computing (HPC) systems to submit and track jobs, perform complex data transformations using a rich library of templates that can help turn data to information, help visualize thousands of data using rich powerful visualizations, export to reports to share and collaborate. Using the HPC application, you can submit and track simulation or non-simulation jobs that require compute resources. You can upload single or multiple files in raw or archive formats or choose files previously uploaded as input files to the solvers. Get live previews of running simulations and control them using a simple interface. Using rich library of post-processing templates to perform post-simulation data extraction and organization. View your data using extensive library of visualizations to understand your information and to help you make decisions quickly. You can customize your visualizations using any of the available dimensions that could consist of both simulation input and outputs. View your 3D data using our native Multi-threaded GPU-Powered Visualizer. After 3 years of Research and Development, we are announcing the introduction of Peacock. The current version supports animation, part selection, part transparency and image capture. It talks directly to d3VIEW to store captured images to allow seamless data visualization to 2D and 3D. 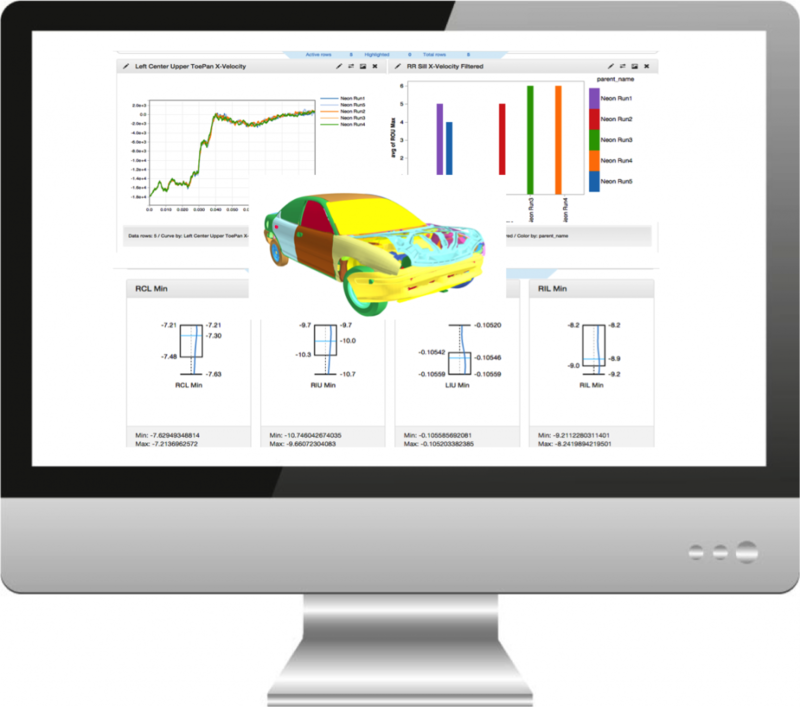 Define and track key performance targets across simulations and tests to help you identify your design performance. You can define numerical or class based targets to help you understand the influence of your design variables and to assist you to achieve your objectives. You can track historical simulations to identify patterns in your targets to improve your future processes. Using our built-in timeline analyzer, you can animate your targets as a function of time to view the evolution of your design and KPIs. Viewing data from your DOE runs can be challenging when running simulations on the cloud or on-premise HPC system. Using d3VIEW’s data visualizer, you can simplify this by aggregating or organizing simulations runs and use a wide array of visualizers to understand relationships between your design and output. You can create pages of visualizations with custom layouts and have the interactive filters to quickly identify designs of interest. d3VIEW’s data to decision framework supports storing, organizing and visualization of experimental data. You can manage all of our experiment results, search and compare them with other experiments or with simulations. Using our built-in data importer, you can seamlessly import data from any formats of Excel and directly compare them with simulations. You can use all the other features as in simulations such as data transformations and templates. You can share the data with others with only a read-only or write access without transferring the data.